The Confederation of Danish Industry (DI) host an annual summit on enterprise policy in Denmark, shaping the annual framework for the state of business and industry, supporting experience, vision for growth and conditions in Danish business – as well as presenting DI’s annual Product Award. Visual concept and venue design and the campaign; 12 Hours of Growth, overall information graphics, communications and campaign concept, communication and signage line as well as the participant kit. 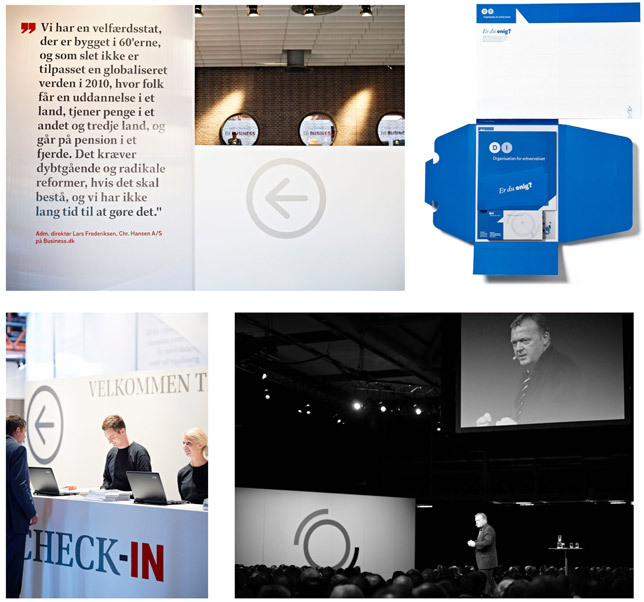 With the overall theme of “Denmark as a Developing Country”, we chose the “virtuous circle” as the theme of growth, and we organized TAP1 at Carlsberg as one giant rotunda. A 360 degree boxing arena was the setting for the summit itself, ready to battle for growth. The summit was held with great success in a dynamic, inclusive environment with a focus on action and consideration. All participants received the “virtuous circle” in two versions with their participant kit: a self-adhesive floor version for two-four people – and a set of big crayons with string and instructions to draw the circle so big that the entire company can be included.